A third type of “lady” ghost (in addition to White Ladies and Gray Ladies), the Green Lady ghost is a very specific specter from Hawaii. There are ghosts, usually from Scotland, that inhabit castles and are known as Green Ladies. However, these are clearly White Ladies despite the color difference. They are spirits of noblewomen and haunt the castles they once inhabited. There’s no real difference other than the color of the apparition. However, the Hawaiian Green Lady is quite different and chilling. The Green Lady is a specific ghost, haunting one area, but is so unusual she rates her own entry. The legend goes that the Green Lady was once just a normal mother who enjoyed taking her children to the Wahiawa Botanical Garden in Honolulu. She and her children would cross the gulch in Wahiawa instead of taking the bridge, as she was afraid the cars would strike her children. One night, on their way back home the children became separated and the mother could not find them in the gulch, no matter how hard she tried. After searching and searching she went looking for help, but no one would help her. She went back into the gulch alone and disappeared, along with her children. Ever since then, there have been sightings of a ghostly green woman haunting the gulch. The ghost isn’t just green, it’s covered in vines and grass, and resembles a shambling marsh monster more than a ghost. The spirit animating the mucky plant life is the ghost of the mother, still looking for her children. However, in her grief she will steal away with any child who comes into the gulch. Children in Wahiawa sometimes dare each other to run across the bridge, as the story says that the Green Lady will even come up on the bridge to take children away. The ghost has even been seen on the outskirts of Wahiawa Elementary School, which is located on the edge of the gulch. The Green Lady has one other important characteristic, which is something not shared by many ghosts – she smells really bad. Most likely a result of the decaying plant matter that covers her (or makes up her body), it’s often easy enough to tell she’s around by the horrible smell. 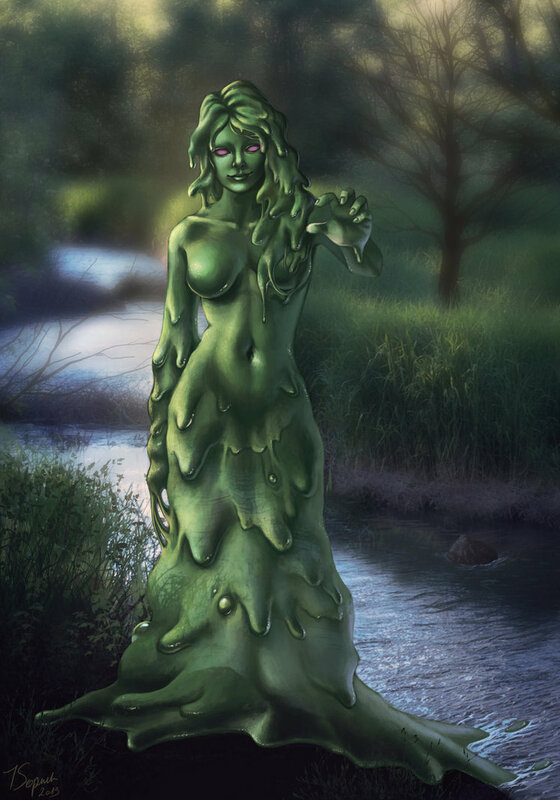 Some depictions of the Green Lady indicate that she looks very much like the Japanese Kappa, a frog/turtle demon with scaly skin and sharp claws.